Identify quality experiences that tourists want to share with others, thus providing continuing demand for the destination. Welcome to our virtual guest book. We thought the best way to demonstrate tourist satisfaction was to give our guests an opportunity to share their favorite Crown of the Continent experience! Have fun reading through the entries and then take a minute to share your own! Pictured: Taking in the splendor of Iceberg Lake on the north east side of Glacier National Park. 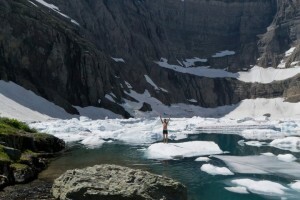 This unique lake gets its name from the chunks of ice it has floating in it year round!